Most businesses recognize the need for forming goals, but many struggle with setting them. 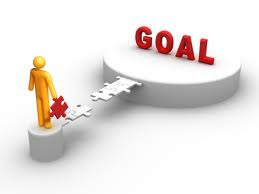 Some businesses will set a goal, but never detail a method of accomplishment. Creating company goals is irrelevant unless you have clearly stated objectives. Additionally, without detailing possible barriers a business might find itself in a rut before it even has moved forward. 1. Compose goals. A goal is a general intention or direction. It normally has a long time frame, and is a purpose to which an endeavor is directed. Increasing awareness, advocacy or sales are all reputable business goals. 2. Establish objectives. Once goals are established a company must decide what efforts or actions will be put towards the attainment or accomplishment. Objectives should be narrow and precise methods with a short term time frame. In addition, successful objectives are reachable, measurable and relevant. For every business goal, include three to five objectives. 3. Identify barriers. Distinguish problems that will hinder your business from reaching its goals. Barriers can include money, time or competition. 4. Form tactics. A tactic is an action to execute your objectives and overcome barriers. A tactic should include an action, purpose, schedule, and a way to measure result. Goal: Increase awareness of our business in the Bloomington community. Objective: Be rated the number one business in the Bloomington area in XYZ magazine. Barrier: Competition from similar stores. Tactic: Put an ad about our business in the local newspaper to gain awareness by Nov. 10. Adapted from “Going for the Goal” by David B. Rockland, PH.D. This entry was posted in General, Tips & Tricks, Uncategorized and tagged barriers, goals, objectives, tactics on October 23, 2012 by Bloomington Chamber Staff.